SATURDAY FEBRUARY 21ST 8.00 PM. Jeff Warner A native of New York City, has lived in Portsmouth, NH, since the late 1990s. He is among the nation’s foremost performer/interpreters of traditional music. His songs from the lumber camps, fishing villages and mountaintops of America connect 21st-century audiences with the everyday lives – and artistry – of 19th-century Americans. “Providing more than just rich entertainment, Jeff will leave you with a deeper appreciation of the land you live in” (Caffé Lena, Saratoga, NY). His songs, rich in local history and a sense of place, bring us the latest news from the distant past. Jeff has performed widely, from large festivals in the UK, to clubs, festivals and schools across America. He plays concertina, banjo, guitar and several “pocket” instruments, including bones and spoons. And “he inhabits a song in a way which few singers can do” (Royal Oak Folk Club, Lewes, UK). 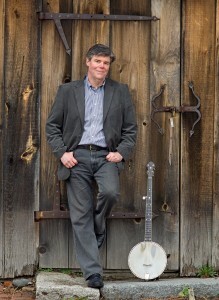 Jeff Warner sings traditional American and English folk songs. His banjo tunes, 18th-century hymns and New England sailor songs are rich in history and a sense of place. He is a Folklorist and Community Scholar for the New Hampshire Council on the Arts and in 2007 was named a State Arts Council Fellow. The Ascott Grapevine Issue 100 Referenced Wychwood Project Forest Update – Winter Issue 57.